I was forced to set aside my scarf this week because Larkspur has a birthday coming up and she requested a hat. I don’t mind making sacrifices like that, because that is just what knitting moms do. But seriously, I do hope I can bring myself to pick that scarf up again. I maybe need to knit another 12 inches which isn’t that big of a deal. 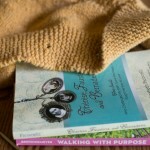 Larkspur borrows my Jane hat frequently and it fits her perfectly, so that is what I am knitting for her. Digging through my stash I found one last skein of Madelinetosh in amber trinket (have I mentioned the fact that I have only been knitting from my stash for over six months? maybe even longer than that.) 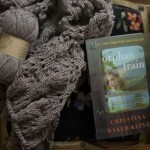 This colorway is so pretty on Larkspur and I am sure she will love the hat, especially because it is like mine. I finished Farm City. It was a good read. 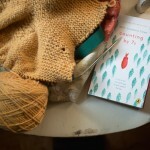 The author has a blog, and it is neat to see pictures of her urban farm after reading about it! I’ve picked up Homegrown and Handmade again. Evidently someone else requested it at the library because I couldn’t renew it. This one is a keeper, so I guess I’ll have to buy it! It really is full of good information in a not too overwhelming format. One of you asked last time I mentioned it what that animal is on the cover. It’s some sort of sheep! It’s odd looking, isn’t it? Jonny has spent the last few evenings reading How to Eat Fried Worms to the kids and they have LOVED it. My boys especially found it to be hilarious. I can’t remember if I read this one when I was a kid or not. That madelinetosh amber is beautiful. Love the colors. I’ve been de stashing and completing unfinished projects too. ( between a needed yarn purchase/gift here and there) must order knit picks interchangeable needles in a sz 13! Thank you for the reminder. I love the colour of that yarn. Homegrown and Handmade looks interesting, I wonder if they will have it in my library. Hmm…I think I should check out the homegrown & handmade book you have up there! 🙂 Sounds like a good read. I have had great time making my early Easter Bunny. Inspired by Arnie and Carlos, I would love to show her to you. I’m so glad I found your blog and that it has shown me so many other new blogs. 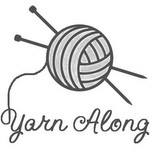 I really enjoy the yarn along, and I try to read all the other blogs that get linked above over the course of the week. 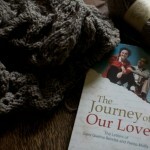 Thanks again for hosting the Yarn Along, Ginny – what a pleasure to join such talented knitters!!! Wow! I remember How to Eat Fried Worms from when I was in public school. That was a LONG time ago! I love the colours you are knitting with! I will definitely have to check that book out, looks great. And I never would have guessed that the animal on the front is a sheep! I think I’ve read that book but I came across the same problem… someone else put a request on the book and I just didn’t have the chance to finish it. I’ll have to try borrowing it again. Thanks for hosting! I’ve only joined up recently; but, it’s been a great motivation for me! Love the color of the hat you’re making for Larkspur. How to eat fried worms sounds funny. I like the way you think.. knitting from the stash!! Me to! I have to, have no more space!! love the hat, and the color is gorgeous! Good for you knitting from your stash! A bit of housecleaning: my first link was broken so I resubmitted, the broken one is 152..I don’t know if you want to delete it or not. Lovely yarn! It will be a wonderful hat for your daughter! I loved that book as a kid! Though it did gross me out…. I am going to have to check out that book from the library! 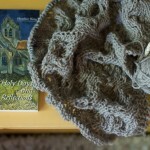 Love that colorway, and hooray for knitting from the stash – same here! The puppy ate my only good hat, so it may be time to knit myself one. I like the pattern that you have been using, so maybe I’ll give it a go. really, really like that color. Is yarn lust a sin?? I like to knit hats, but I don’t really look that good in a hat…maybe I just need to find a different hat to try? Fried Worms..seems like i remember making fried worms from melted Choc Chips and chow mein noodles. Maybe for a reading class? They were fun. I like this age of fiction to read. Have to check out this farm city book. I’ve started trying to keep a list on my phone of books I want to explore. Before it was dozens of wayward slips of scrap paper. Just wanted to say how much I appreciate this weekly post. Even when I’m crazy busy I try to hop over to your post a few others. And thanks for your other honest posts. You’ve touched my heart many times. 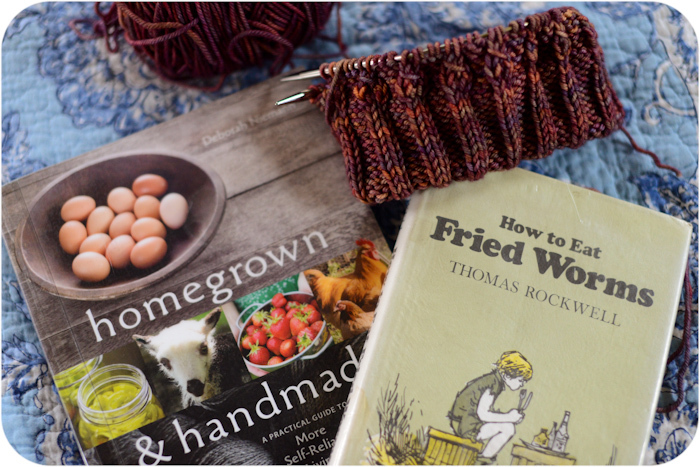 Well, I have the same book and the same project as last week, so my update is super exciting… although I am proud that my sweater now looks like a sweater. Yay me! The hat looks great! 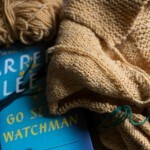 I love Madeline Tosh (the sweater I am working on right now is in Vintage) and aren’t special request knits the best? They make me feel so appreciated.